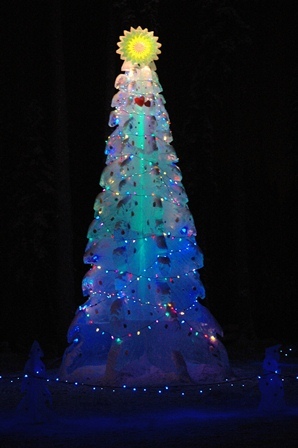 Christmas In Ice, Inc. is a 501(c)(3) nonprofit organization promoting ice carving, arts and education. Our 12th annual winter "Christmas in Ice" event begins December 1, 2018 and closes January 8, 2019. Local and international ice carvers compete in single, multi-block and junior division ice carving competitions, transforming massive blocks of ice into beautiful and creative pieces of art. Come enjoy the ice maze, plenty of ice slides and twirlers. If you want to try your hand at carving, sign up for the Amateur Exhibition and work on your piece throughout month. Special events include BP's Community Picnic, Military Appreciation Day, Christmas Day with Santa, and the New Year’s Eve fireworks display. Discount admission coupons are delivered to all elementary school children in the Fairbanks North Star Borough, and a senior admission rate is offered daily. We will have trailers set up between Santa Claus House and the Reindeer as our warming area where you can enjoy beverages and light concessions, and shop for logo gear and clothing, sleds and unique post cards. Join now to start donating 3-30% of every purchase to Christmas in Ice while you shop online at places like Home Depot, Best Buy, and eBay.